“Azerbaijan Wine House” has been opened in Shanghai on November 7. SAVALAN wines beside other Azerbiajni wines will ve sold in the Wine House, which was created by the Ministry of Economy of the Azerbaijan Republic to promote the “Made in Azerbaijan” brand in the Chinese market and to expand the export of Azerbaijani products. 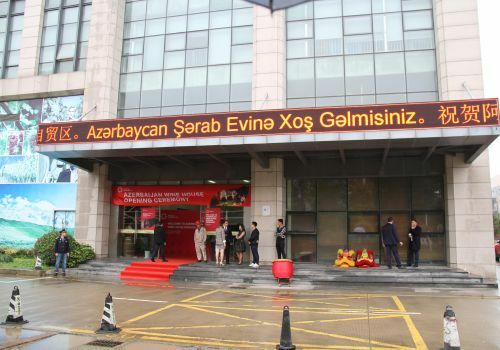 The exhibition of various products of Azerbaijani companies was organized at the opening. SAVALAN wines, produced by the “ASPI AQRO” were widely displayed at the Wine House. At the same time, more than 120 varieties of grape and fruit wines, alcoholic drinks, fruit distillates and other products produced by local companies will be displayed in the “Azerbaijan Wine House”. General Managers of “SAVALAN ASPI Winery” company Arif Rahimov and Fuad Seyidaliyev participated in the opening of the wine house.